When we first moved into our house about 2 years ago, something needed to be done about the countertops. We first tried painting them in this post here. But they are chipping and hard to keep clean. I am also not in love with our sink. Today I am excited to say that I bought myself a rock! 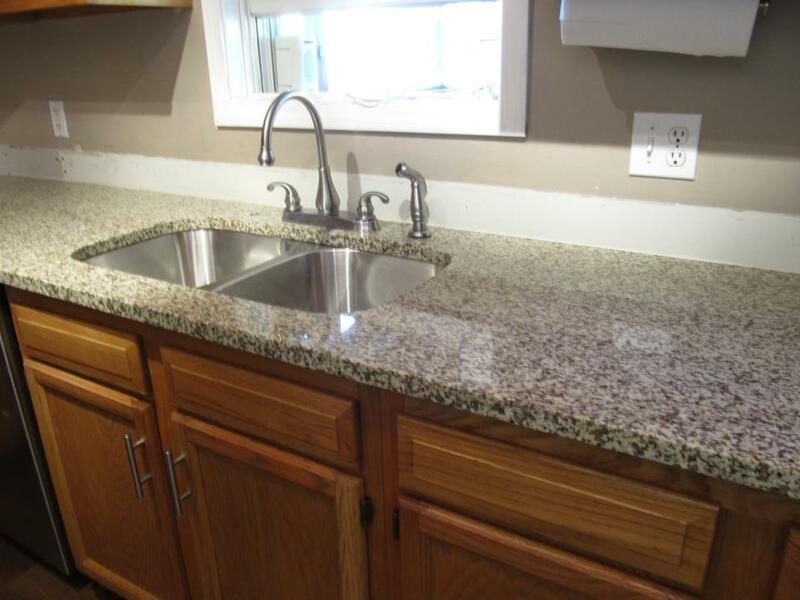 A granite counter top. This purchase is harder than buying a piece of furniture. You need to measure and choose colors. Think of how to dispose of the other counter, how to reattach the new sink to the pluming and how the finish product with look with the wall color. After calling around to many stores, Lowes was the least expensive. After getting a 10% off coupon from Lowes, and using the Discover 5% cash back I made the purchase Below are the pictures. I will keep you updated with more information and pictures as we move forward. I went with Durango which is a type (A) (Least expensive) granite. The origin is Spain. In Sensa granite the same color Iberian Sunset. 3. What Type of Sink? Then they tell you that the process can take anywhere up to 21 working days! That is a long wait for me! First someone needs to make a template of the counter tops They tell you the cabinets need to be in place incase you have a new home. They told us we need to move the appliances when they install the counter top. We will need to remove the countertop before install (more on that later). Also, we will need to wait a full day until we hook up the pluming. Someone came to do the measurements which took about an hour. He needed a cleaned off counter do do the process as he took measurements at different points. He told me that there may be a seam but it is up to the people that cut the granite. I am crossing my fingers so that there won't be one! I also had to have the faucet. We are using our old faucet because we got a new one a couple years ago. I made the decision to have 2 holes next to the faucet. One for the water sprayer and the other for a soap dispenser. I don't like stuff on the counter so I am excited about this one. The next two steps are removing the counter and installation! 5. Will someone be home for them to measure the counter? 6. Will Your Cabinets Hold the Granite? 7. Do you need a hole for a Kitchen Sprayer? 8. Do You Need a Hole for a Soap Dispenser? Next the sink pluming needed to be removed. After watching may youtube videos, I was ready. I learned the tip to take pictures of your pluming before removing anything. Then when you want to put it back together you can refer to the picture. I know it is much easier to put together a puzzle when you can see the finished product on the box. 9. Who will undo the pluming? 10. Do you want to purchase a new faucet? 11. Do you want to purchase a new drain? We realized they had some measuring issues the first time they put in our counter top. Instead of cutting the counter, they took out some dry wall! So we had to cut the counter in half to get it out of the house. We then gave someone the sink for free on craigslist. Saving the earth, and we don't have to pay a fee for our trash people to take it. 12. How will you take the old counter off? 13. How will you dispose of the old counter? 14. How will you dispose of the old sink? We are now waiting for the installation of our countertop. Take out food for a couple days. But it will be worth it! 15. 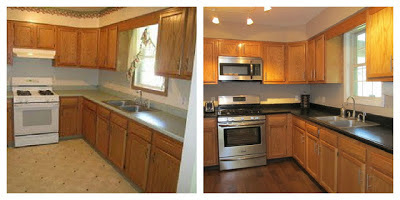 Will your family survive without a counter top and more importantly a sink/dishwasher for a few days? This way was the easiest. Let the two guy team come in and do there job. This is what it looked like when the left. We still need to wait 24 hours to hook up the pluming. Lisa is the creator of the blog Charlie-The-Cavalier and His Friends, Family, and Home. She is also the author of 50 Things to Know Before Having a Baby. Send Lisa Rusczyk and email at lbrennec@gmail.com.